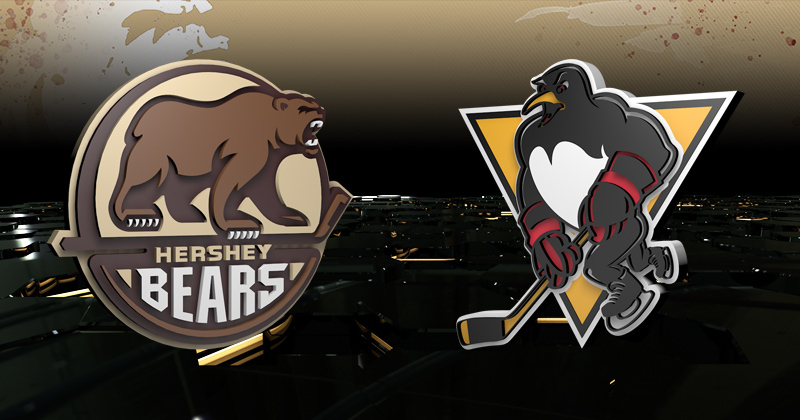 03/19/2019 - (Hershey, PA - March 19, 2019)-The Hershey Bears wrap up their 12-game season-series against the Wilkes-Barre/Scranton Penguins tonight at Giant Center. The Bears look to extend their current point streak to seven games and are 8-2-0-1 against the Penguins this season. Tonight also marks Hershey's first home game on a Tuesday since Dec. 29, 2015. That evening, current Tampa Bay Lightning All-Star goalie Andrei Vasilevskiy stopped 29 shots to lead the Syracuse Crunch to a 3-1 win over the Bears at Giant Center. RADIO: WQIC-100.1 FM, WOYK 1350-AM, Fox Sports 1460-AM, Voice of the Bears Zack Fisch, Mitch Lamoureux, and Jim Jones on the call. The Hershey Bears are fresh off a commanding, 5-1 win over the Bridgeport Sound Tigers on Saturday night at Giant Center to push their current point streak to six games. Garrett Pilon opened the scoring 9:31 into the game on a chance from the low-slot, and Aaron Ness doubled his team's lead to 2-0 on the power play at 18:30. In the second period, Riley Barber scored a pair of goals within the first five minutes of the second stanza, and Mike Sgarbossa tallied at 10:22 to round out a 5-1 final. The Wilkes-Barre/Scranton Penguins were in action last Sunday and dropped a 4-2 decision to the Toronto Marlies. Jimmy Hayes and Jarrett Burton scored the lone goals for the Baby Pens. Tonight marks the 12th and final game in the season series between the Bears and the Baby Pens. After winning just two games versus their I-81 rival last year, the Bears have flipped the script this season, dominating the season series, posting an 8-2-0-1 record versus Wilkes-Barre/Scranton. Hershey has won the past five games versus the Penguins in the season series. Former Penguins sniper Jayson Megna leads Hershey in goals in the season series with eight, while Aaron Ness and Mike Sgarbossa have a team-high 13 points. Wilkes-Barre/Scranton enters tonight's game in 5th place in the Atlantic Division, trailing 3rd place Hershey by eight points in the Atlantic Division standings. The Penguins have played one less game than the Bears heading into tonight's contest. A regulation win for the Bears would move Hershey's magic number to 15. Mike Sgarbossa enters tonight's game following his best individual performance in his 424 game professional career. Sgarbossa set a career-high, four-point night with one goal and three assists to help his club to a 5-1 win over Bridgeport last Saturday. It marked the fourth time in his professional career he received three helpers in a single game. The 26-year-old forward is in the midst of a career year, tallying 27 goals and 30 assists for 57 points, and is one goal away from 100 in his American Hockey League career. Aaron Ness scored on the power play late in the first period last Saturday, and it stood as the eventual game-winning goal. The tally marked Ness' first goal since Jan. 5 against Grand Rapids, and first game-winner in over a year, with the previous mark on Mar. 9, 2018 versus Syracuse. Ness' 43 assists is the second-best in the AHL, and top among all active blueliners. In addition to his scoring touch, the fourth year Chocolate and White defenseman also leads the club in plus-minus (+16). Hershey forward Riley Barber is coming off his sixth multi-goal game, and his 17th multi-point game of the season in the club's win over Bridgeport last Saturday. In that contest, Barber scored his 30th and 31st goals of the season, earning the distinction of being the top goal scorer in the American Hockey League. Barber also ranks 5th in the AHL in points with 58 this season, a new career-high. The winger has had success versus Wilkes-Barre/Scranton this season, scoring 10 points (seven goals, three assists) in nine head-to-head matchups. In Hershey's last outing versus the Baby Pens on Feb. 22, Barber had a hat-trick. Barber has collected eight points (five goals, three assists) in his past six contests for the Chocolate and White.